A story to be lived, through the great music, towards a world in harmony. From BELLANGELBOND we invite you to join us to create a world in peace. From Bellangelbond we will bring you close to the great musical works of all times so that you can discover that all Joy, Beauty, Peace and Kindness that we often seek outside ourselves is actually part of our basic nature. Once you realize that these feelings are deeply rooted in yourself, you will start living happily, with the wish that all fellow men may share in that happiness. This is how you will help build a world in harmony, a world in peace. An open invitation -both in Argentina and the USA- for all the family, kids, young ones and adults. It is not necessary to have any previous knowledge of music. You can participate and become a "Protagonist of a world in harmony", just by completing Interactive Guide No. 1. The world needs you. Join in! You can buy it at our online store. A proposal for this world. A world that is marked by violence, corruption, absence of dialogue and lack of respect and values and that seems to be on the brink of destruction. A proposal that demands that something has to be done and that reminds us that the solution is within ourselves. 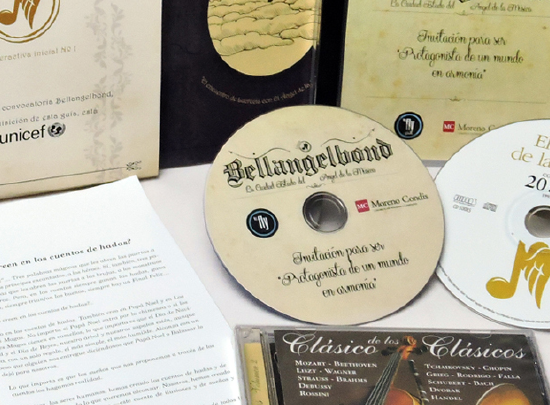 Bellangelbond proposes a way to achieve this by bringing you close to the Great Music, the wonderful musical works of all times, to discover its power. The music that has transcended the frontiers of time and the geographical borders of countries can help us build a new world in harmony and peace. Music has power. There is no doubt about it. Nowadays, music therapy shows us that the power of music to improve different health-related problems is fantastic. In ancient times, great philosophers such as Plato and Aristotle believed that certain melodies could arouse feelings of harmony and kindness. Other philosophers from more recent times such as Schelling, Schiller or Schopenhauer, highlighted the transforming power of a work of art. Today, Guillermo Jaim Etcheverry, says that the great works of music transcend time because "they communicate with the deep feelings that we house within ourselves, thus helping us to get to know ourselves better". Sergio Sinay also states that "Art makes us human since we are the only creatures that can express feelings, sensations and spirituality". Ken Wilber postulates that "the work of art reminds us of our highest potential qualities, our deepest nature and our innermost foundations, inviting us to rediscover them". Bellangelbond's proposal is aimed at bringing closer the great musical works of all times to all your family members so that they can discover that all these feelings such as Joy, Beauty, Peace and Kindness, which we seek outside ourselves, are actually part of our inner selves. Thus, when we discover this, we will be able to live happily, in harmony with ourselves, hoping that all our fellow men may also share this happiness with us. The main purpose of Bellangelbond is to help in the creation of a community of "Protagonists of a world in harmony, a world in peace". This is BellangelbondÂ´s proposal, which is expressed through a "fictional story" in which we- all the family, kids and adults- can participate. A story that tells us that: Once upon a time, on a huge white cloud traveling through the skies over the Earth, there was a city named Bellangelbond, the City State of the Angel of Music. A City that today keeps on traveling across the skies as vividly as ever... The Angel of Music lives there, at the top of his castle tower. He is not alone. Jubal-the City Protector-, Otsadan, Swansi, Lusdil, Druambi, Dramsel, and other friends live with him. And many other characters from operas, zarzuelas, musicals, ballet and musical theatre also live in the City, together with all the musical instruments that have life of their own! !- Bellangelbond can only contact the Earth through its Embassies. The Angel of Music has a very important mission to accomplish: to guide all human beings, through the Great Music, in the creation of a world in harmony. Everybody can participate in this story and become a "Protagonist of a world in harmony". The world needs you. Become a part of Bellangelbond, Join us! The first and necessary step to participate in this story is to obtain Interactive Guide No. 1. DVD - "Invitation to become a Protagonist of a world in harmony". A production recorded in Hollywood featuring Ginger Pennington, Katie Eichler, Jaime Maravilla, Karla Moran, Ã�ngel Saucedo, Giovanna De Carlo and Armando Heredia. CD - "The Angel of Music - 20 years". A special production featuring Rodolfo Mederos, Rafael Gintoli, Mónica Capra, Horacio Lavandera, Darío Volonté, Vera Cirkovic, Luis Salinas, María Bugallo, Jorge de la Vega, Franco Luciani, Emme & Hernán Jacinto, Haydée Schvartz & Elías Gurevich, with other invited musicians and with musical direction by Lito Vitale. CD - "Classic of the Classics". This Guide invites participants to listen to "The Angel of Music - 20 Years" CD, which was especially produced for this proposal, so that they can get in contact with Jubal, the main character of this story at Bellangelbond's website (www.bellangelbond.com), to tell him if they liked one or more musical works from the CD and to describe the feelings that these pieces of music arose in them after listening. Jubal would also like to know how the participants imagine a world in harmony, how they dream of a better and more peaceful world, the world of their dreams, which they will have to help build by committing themselves through small but meaningful actions. In this way, they will become "Protagonists of a world in harmony". Then, depending on the musical sensitivity that they showed through the musical pieces of their choice, Jubal will answer them and suggest other works of music from the "Classics of the Classics" CD. He will also send the participants a gift from the Angel of Music. The first steps have already been taken for the participants to start discovering the amazing world of immortal music, which will gradually help them discover their inner wealth. This is the sequel to the original story "The Angel of Music"
Gorostiaga 2441, Phone: (011) 47722329, Ciudad Autónoma de Buenos Aires.